In November 1995 an agreement for cooperation between the Technion and the Politechnico di Milano was signed. In addition to agreeing to encourage student and faculty exchanges and joint research, we also agreed to attempt to encourage cooperation between Italian and Israeli industry. 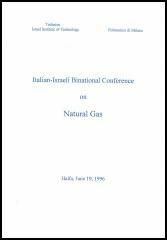 The first fruit of this effort was the Binational Conference on Natural Gas held at the Technion on June 19, 1996. The Conference brought together senior scientists, engineers and administrators from both countries who are involved in the natural gas industry. This subject is of particular interest to both countries as Italy has a well-developed industry with much experience in gas distribution and utilization and Israel is in the process of planning for a nation-wide gas distribution system. These proceedings are a collection of the papers presented at the Conference.